12.09.12 Det tsjekkiske medlemmet av EU-parlamentet, Miroslav Ouzký, saksordfører i miljøkomiteen for lov om nye støykrav for bil, benekter at Porsche laget utkastet til det kompromissforslaget som i forrige ble levert komiteen. Etter at Transport & Environment blåste i fløyten på mandag, har saken fått store oppslag i europeiske media. Euractiv hadde et stort oppslag onsdag (se nedenfor). BBC har varslet en omfattende reportasje denne uken, og ukemagasinet European Voice har også bebudet en stor rapport denne uken. EU´s lovforslag om nye støykrav til biler er karakterisert som en historisk mulighet til å vedta regler som virkelig monner i kampen mot helseskadelig trafikkstøy. De grenser som det opprinnelige forslaget fra EU direktoratet signaliserte, ligger innenfor tilgjengelig teknologi for bilindustrien, og vil kunne føre til en halvering av støyen. ( Se link ) Det foreliggende kompromissforslaget har derfor vakt stor oppsikt, for måten det har blitt til på. Debatten om lobbyistenes påvirkning har blusset opp til ny storm. Ouzky representerer partiet ODS (kristelig demokrater) i Tsjekkia, og har tidligere også vært leder av Miljøkomiteen i EU-parlamentet. Han benekter at Porsche har skissert kompromissforslaget til ny EU lov om bilstøy. Han opplever samtidig å bli stilt spørsmål om en rekke kontakter mellom sin forretningsvirksomhet og Porsche, og sin rolle i forbindelse med en korrupsjonssak som etterforskes i Tsjekkia. The lawmaker in charge of steering legislation on traffic noise through the European Parliament has insisted that he wrote it, despite evidence that a draft version of the bill was authored by an official from Porsche AG, the German car manufacturer. The Transport and Environment conservation group blew the whistle, saying the European Parliament’s rapporteur for roadside noise emissions legislation, Miroslav Ouzký, was “unduly influenced” by the German car manufacturer. One leading MEP, Judith Merkies, has pointed to a parliamentary inquiry to clear up the accusations. Lobbyist influence on the legislative process is a hot topic in EU circles, inspiring a recent film, The Brussels Business, but it is unusual for an environmental group to go public with such strong allegations. The story began when Ouzký, a Czech Conservative MEP, circulated a compromise proposal to set new noise limits in the Parliament’s environment committee on 7 September, after a June deadline had been missed. Green groups balked at its measures, which they said would weaken existing noise limits in force for 15 years, exempt some vehicles from them altogether, and set poor future standards for heavy vehicles, which would then not be implemented until 2024. But their shock turned to anger when they found what they believed to be the smoking gun of “undue influence” by the motor industry in the ‘properties’ box of a Microsoft PowerPoint document containing a key table in the draft law. The document’s author is listed as Hans-Martin Gerhard, the head of Porsche’s Acoustics department, who had previously written a contentious legally-binding noise standard measurement for the United Nations Economic Commission for Europe (UNECE). The powerful engines in the German-made sports cars are notoriously noisier than those of nimbler vehicles. “If an allegation about an interest group or industry doing the work for an MEP proves to be a serious one, it needs to be investigated,” Judith Merkies, a Socialist MEP and shadow rapporteur on the noise emissions file, told EurActiv. “I trust that the president of the parliament, Martin Schulz, as the guardian of the code of conduct, will look into any serious allegations,” she added. Ouzký insisted that he had done nothing wrong. “The PowerPoint table that I used to formulate the amendment had originally been drafted by Porsche so it has their signature on it,” he said in a statement. Contacted by EurActiv, he added that the table had been one of many submitted and that the final figures within it were “far from the position that Porsche would like us to take”. “I thought it was the best [table] and very close to the Commission’s proposal so we used it, but the figures and content were the work of my office,” he said. Ouzký declined to share the original proposal, saying that a meeting of shadow rapporteurs had unanimously agreed that it should be kept secret. But EurActiv has learned that there is no such unanimity among the shadow rapporteurs. Porsche, a division of Volkswagen, moved quickly to distance itself from the gathering row. “It is not a Porsche proposal,” a spokesman for the company told EurActiv. “Mr Gerhard is an expert of ours but in that special matter [the noise emissions proposal] he [was writing as] the chairman of the working group on noise at OICA.” OICA is the International Organisation of Motor Vehicle Manufacturers. Several statements by Ouzký claiming that the document had been written by Porsche – or one occasion by Porsche and the European Automobile Manufacturers Association (ACEA) – were “wrong” the spokesman said. “MEPs must reject these biased compromise amendments and ensure that the regulations lead to a progressive tightening, not weakening of noise from vehicles,” said Greg Archer, Transport and Environment’s clean vehicles spokesman. Ouzký strongly denies any business connections or interests with Porsche, beyond the fact that he happens to drive a Porsche Panamera. However, his CV is listed on a Porsche financial services website. 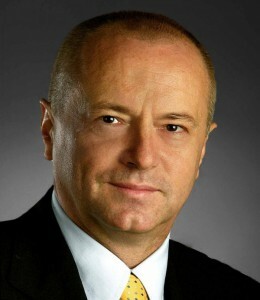 At the time of publication, Porsche had not responded to a request for clarification of Ouzký’s connection with the company. No links with Porsche are listed on the MEP’s declaration of financial interests. But Ouzký has other business interests, and did co-found a Czech project called IZIP which provides electronic health cards to patients, and received a government contract which was not put out to tender. It is currently the subject of an Interpol criminal investigation into hundreds of millions of Czech crowns which are thought to have gone missing, according to the Prague Daily Monitor. Last year, Ouzký and his partner, the Czech MEP Milan Cabrnoch sold their share in the company to eHI eHealth International. Parlamentsmedlem i EU-parlamentet og saksordfører for ny lov om bilstøy, tsjekkeren Miroslav Ouzký, benekter at Porsche har laget utkastet til ny lov. Men må samtidig tåle nærgående spørsmål om sine øvrige forbindelser til Porsche. Foto: Partiet ODS´ pressetjeneste.